Vote for your Chip Shop of the Year 2019. 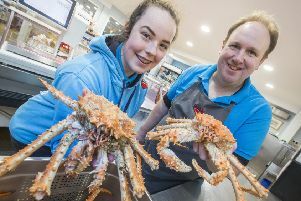 We are on the lookout for South Tyneside's best chip shop of 2019 - and we need your help. Cod or haddock? Mushy peas or curry sauce, with or without salt and vinegar, there’s nothing we Brits love more than a fish supper from the local chippy. And with literally thousands of chip shops in the UK everyone has their favourite! It could be because of the freshly-cooked food, traditional-style dishes, select and exclusive dishes you can find in only the place you use. We have drawn up a shortlist of chip shops and restaurants which will compete for the title of Gazette Chip Shop of the Year 2019. Entries will be printed in the paper and online until April 13 , so you can vote for your favourite. To vote from the list, simply return the coupon which you'll find in the paper to us, stating the voting number, full name and address of the chip shop or restaurant you wish to vote for. Closing date for votes is April 20, 2019. Photocopied or defaced coupons will not be accepted. SGZ001 Golden Chippy, 21 Hedworth Lane, Boldon Colliery. SGZ002 Boldon Bite, 92 Hindmarch Drive, East Boldon. SGZ003 Hebburn Golden Fry, 156 Hedgeley Road, Hebburn. SGZ004 Dillions Fish Inn, 43 Station Road, Hebburn. SGZ005 Tony’s Golden Fish And Chips, 95 Edinburgh Road, Jarrow. SGZ006 Billy's Golden Fish And Chip, 31 Fellgate Avenue, Jarrow. SGZ007 Paul's Golden Chippy, 301 Albert Road, Jarrow. SGZ008 Primrose Golden Fish And Chips, 54 Norman Terrace, Jarrow. SGZ009 Frydays Fish Bar And Grill, 27 East Smithy Street, South Shields. SGZ010 Dave's, 12-13 Queens Street, South Shields. SGZ011 Smith’s Chippy, 108 Ocean Road, South Shields. SGZ012 Red Hut, 102 Ocean Road, South Shields. SGZ013 Colmans, 182-186 Ocean Road, South Shields. SGZ014 Blue Marlin, Sea Road, South Shields. SGZ015 Westoe Golden Chippy, 58 Westoe Road, South Shields. SGZ016 Gills Golden Chippy, 511 Stanhope Street, South Shields. SGZ017 Frankie's Fish And Chips, 8 Stoddart Street, South Shields. SGZ018 Green Lane Fisheries, 250 Green Lane East, South Shields. SGZ019 Highfield Fisheries, 102 Highfield Road, South Shields. SGZ020 Billy's Golden Fish And Chip, 18 Horsley Hill Square, South Shields. SGZ021 Gills Golden Fish And Chips, 359-361 Prince Edward Road, South Shields. SGZ022 Gills Fish And Chips, 44 Stanhope Road, South Shields. SGZ023 Biddick Hall Golden Fry, 2-4 Fielding Court, South Shields. SGZ024 Karl's Golden Fry, 30 North Road, Boldon. SGZ025 Super Fry, 289 Sunderland Road, South Shields. SGZ026 Singh's Fish Bar, 136 Quarry Lane, South Shields. SGZ027 Codfellas , 62 Stanhope Road, South Shields. SGZ028 The Codfather, 202 Whiteleas Way, South Shields. SGZ029 Mary's Fish And Chips, 10-12 Seton Walk, South Shields. SGZ030 Daniela's Fish Bar, 58 Front Street, East Boldon.